The rate of unemployment in Brazil fell to a ten-year low of 5.5 percent in 2012, down 0.5 percent on the previous year, figures released by Brazil’s office of national statistics, the IBGE, have revealed. This is despite the economy struggling in 2012 and registering only one-percent growth, dubbed a “pibinho” (small GDP) by economists. 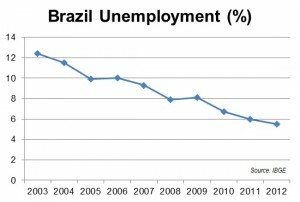 Unemployment in Brazil fell to a ten-year low of 5.5 percent in 2012, down 0.5 percent on the previous year, image by The Rio Times. December’s rate was just 4.6 percent, the lowest since the IBGE began its monthly report on unemployment levels in 2002. Ten years ago, in 2003, the rate was over twelve percent. Yet economists have warned that the apparently positive figures oversimplified the real picture of the Brazilian economy, and that it was wrong to suggest that Brazil is experiencing full employment. They point to the considerable difference encountered between the regions surveyed in December – from three percent in Porto Alegre to 5.7 percent in Salvador. December is also traditionally the month with the lowest rate of unemployment, as people give up looking for work during the festive period. Moreover, experts say the 2011 figure was “overheated” by the country’s recovery from the 2008-09 economic crises.